One of the really useful things about using a system like Jumplead is that you get an insight into the unique activity of your contacts and are able to use this information to inform sales and marketing activity. Yes, you can see who is on your website and the pages they are visiting, when they are visiting them, you can also drop onto chat sessions with your visitors to help them directly. But you can’t monitor all of this manually, 24-7. It makes sense to think about any particular pages you are par- ticularly interested in knowing about when people visit them, and narrowing down the geography of the prospects you are interested in, then setting up notifications to alert you when this high value activity happens, allowing you to follow up their interest appropriately. 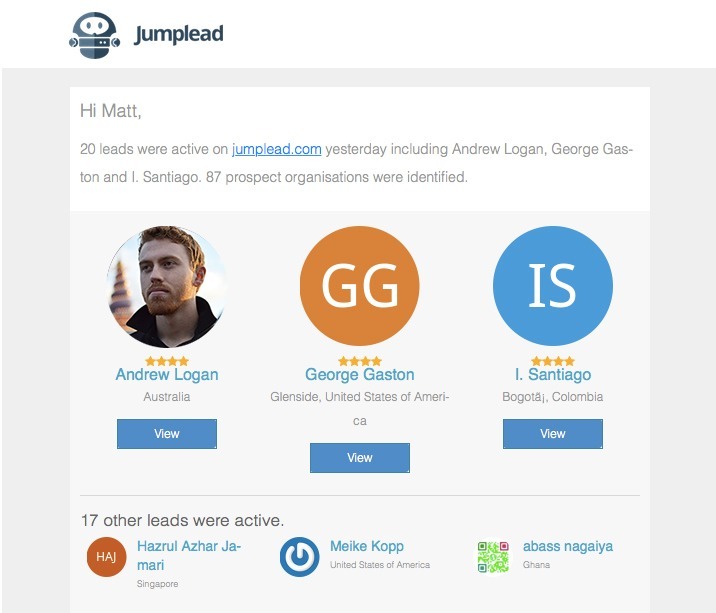 Jumplead also sends out a daily lead summary that recaps on the activity from the previous day, so you’ll always have a heads up on lead activity in your inbox. 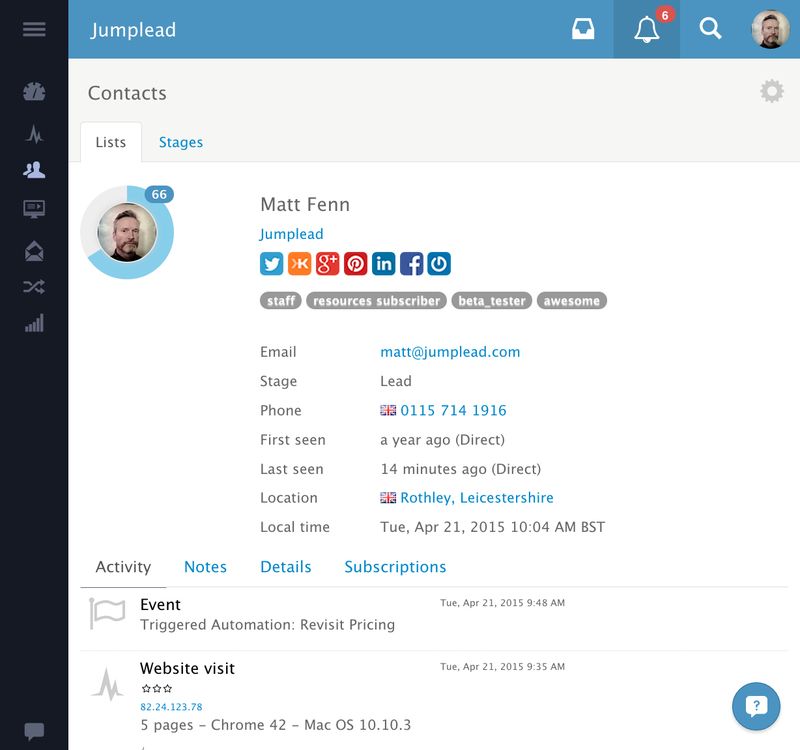 When it comes to monitoring the activity on your website Jumplead separates out your prospects from your visitors automatically, if a contact has clicked through to your website from a Jumplead email, or has completed a conversion form they will be individually tracked and their activity history is stored as part of their Jumplead Contact profile. Even if a visitor hasn’t converted we analyse their IP address to see if their organisation is of interest, and if so we’ll list them as a prospect organisation. Sometimes there are specific types of visitor or behaviour that you are particularly interested in, you might even want to get a notification or trigger a marketing automation when a returning contact matches your criteria. In these situations you can use activity streams and automations to create a targeted visit scenario and use it to send a notification or even trigger an auto responder for the visitor. For example, I get a notification whenever a contact views our pricing page, some people use region filters to send notifications to relevant sales team members when contacts from certain regions return and view key pages. Keeping an eye on relevant Twitter conversations is useful in a number of ways, from allowing you to engage with conversations that are going on about your business or industry, to helping people looking for advice and recommendations, to keeping track of new blog posts that you might want to read and comment upon. I would recommend using Twitter monitoring to jump in and engage with bloggers in this way as it does mean that you are often the first to read and comment, and a carefully crafted blog comment for a popular post can generate traffic for a long time. 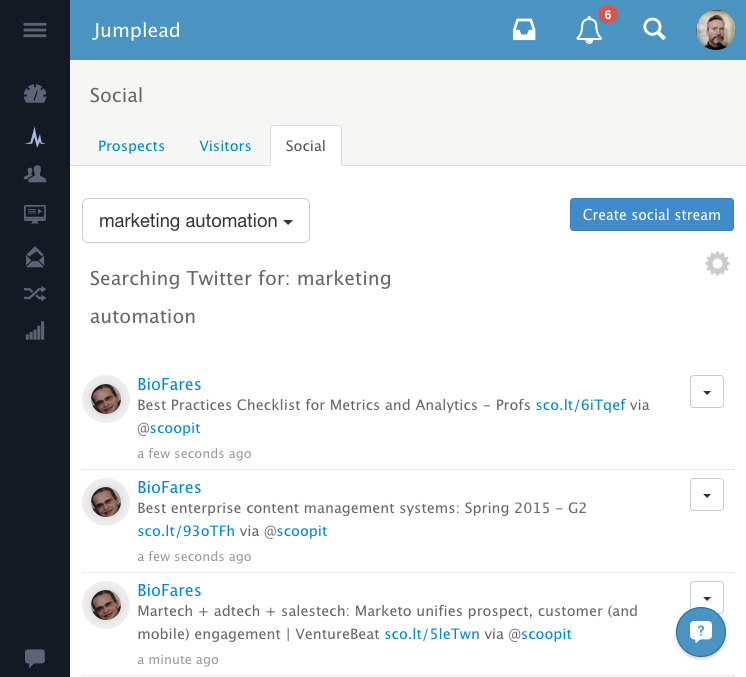 To get started, add Twitter as an integration in your Jumplead settings, then create your Social stream from the social tab in the activity section. Live chat enables you to connect with visitors to your website when the time is right for them, answering any questions directly and increasing the perceived support level for your business. Jumplead chat is currently pro-active which means that when you have operators available they can choose which visitors they wish to offer a chat session to. While it’s great to be able to react to your prospects and have this kind of sales intelligence on a day by day basis, it’s perhaps more important that this activity information is used to score your contacts, highlighting those who are of particular interest. And available to help you refine your future communications with them.